Automobile industry in India is changing rapidly. Whether they are Indian companies or foreign, both want to increase their market share. Hence, competition is very high among these companies to get their share of profit. This is good news for both, consumers as well as for students who are looking for jobs in automobile industry. As a matter of fact, automobile industry is among top hirers in Year 2017-2018. They are recruiting large number of candidates in their company. Therefore, if you are a fresher with a degree in automobile engineering then you have a great opportunity to get a job in automobile industry. Let us see, what you need and how you can get the job. Jobs in automobile industry, is only in private sector. There is a very little opportunity that a graduate in automobile engineering would find a job in government sector. It means jobs are not in government sector. Candidates who want to become an automobile engineer and serve in government job has very less chance. Hence, it is advised that candidates should look their prospect in private sector rather than government sector. Moreover, automobile engineering jobs could be in Indian companies as well as foreign companies. You have to decide which company you want to work for. So again, there is no job in government sectors. As I said companies that are offering jobs are both, Indian as well as overseas. It is up to you which company you would like to join. However, I will give you name of some famous companies that you might know or would like to join. All the automobile companies are very reputed and pioneer in their field. All of them can offer a job that could be promising as well as pay you a high salary. Manufacturing: Manufacturing engineers would deal with mass production of the vehicles. As a fresh automobile graduate, you must start developing these skills if you want to get a job. A job of an automobile engineer demands so much from you, but at the same time it is ready to pay you back something in remuneration. If you are from institutes like IIT then you could expect more. More experienced could get even more. Here are the websites of some colleges that offer courses in automobile engineering. I always tell you the future of any job before you apply for it. India growing rapidly hence middle class would buy new vehicles. Moreover, India has a large youth population which is ready to be employed. Therefore, you can look forward as an automobile engineer. Finally, I will conclude by saying that jobs in automobile industry are mainly in private sector not in govt sector. If you are a fresher then your future as an automobile engineer is very bright. There is a lot of scope in this field. Only thing you would require is right kind of skill and a strong desire to succeed. Goodevening I have completed MBA from Tezpur Central University in operations and marketing. Currently I am working as a management trainee. Please guide me how to make my career in automobile industry. hello sir. I am a 12 pass student till now . I wanted to be an automobile engineer.as I like automated vehicles very much. I have applied for tnea 2017 and hope to get a very good college. I am sure that I will make my self a very innovative engineer in the study period of my college . so can u tell me which of the company can give me a good salary package and a very reputed experience to move on in my career. I completed my automobile assambly and service certificate course from indo-german tool room indore, m.p. I have to year work experience with eicher motors in transmission line. Plz suggest me the best job for my bright future. i am the fresher, i just completed our b.tech degree from uttarakhand technical university and secure 78% in me stream. i also qualified the gate with 40.44 marks in gate 2017..
Thnx to this giving information.I completed diploma in automobile2016 batch.Problem is in everywhere the company tried to taken reference candidate.They choose first preferenca to them then next to walk in candidate.3 times i failure to get job …i face interview smartly later they ignore.i try to call HR but they didnt responce……. I completed Be in automobile.i want to job in good vehicle manufacturing company so please suggest me how to achieve my goal? Iam doing DEPLOMA IN AUTOMOBILE ENGG i want to design our INDIAN cars, so what should i do after the deploma??? Sir,i am automobile diploma engineer.i completed diploma in 2014 from kmct polytechnic college, cailcut, kerala.i am working in ashok maruthi suzuki dealership sai service pvt ltd as service advisor till August 2014. I have done diploma in mechanical engineering in 2016 . & Now finding a job . Suggest me 8445557733. I am Apurva Chakraborty as Automotive diploma person, 9 yers experience,ford,toyota,renault cars. I have require a jobs in abroad country. I am hareesh .3 year exprience automobile industry production assmbly line works. 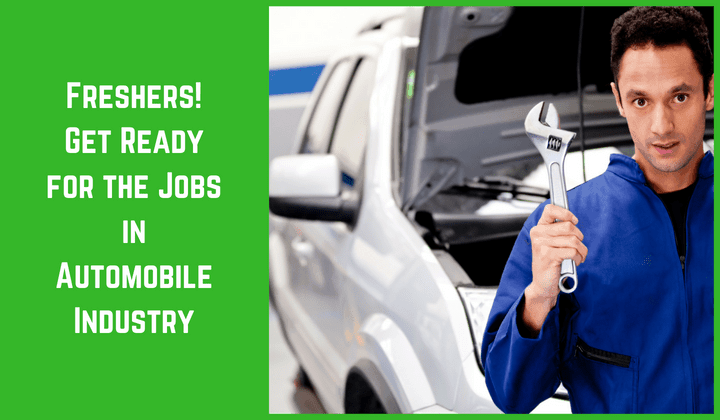 I have complicated diploma automobile so I want job in service supervisor…. Today i am in automotive seating indusry but i want job in car manufacturing.